Ronald Reagan Washington National - Kona Intl. Washington Dulles Intl. - Kona Intl. Great bar and bartenders. It rained a lot on my trip which lead to canceling some excursions, but I enjoyed being stuck at the hotel with a book immensely. Great seating in the entry with a beautiful view of the bay. Hotel is older and small, but close to everything and priced affordably. like the fact the it felt like home with a studio feel to it. Keen to organize your amazing Hilo trip? The expert team at Orbitz will coordinate your hotel and flight bookings for the best deals. How do savings of up to $857* grab you? Simply pick your desired airfares, hotels, rental cars and experiences and you'll have a little extra spare cash jingling around in your pockets! With 500 partner airlines to choose from, you'll be up and away in no time! And if you aren't sure where you'll stay, we've got an amazing database of more than 500,000 worldwide hotels. You're guaranteed to find something to suit your style. Our packages offer limitless options to customize your trip along with an experience you'll always remember. We've built a simple system that'll reward you quick smart! All you have to do is book with us and you'll get instant Orbucks! Redeem your Orbitz Rewards points the next time you book. If you secure four nights in a full year, you'll become a gold member; 12 nights gives you platinum membership. Perks, like complimentary breakfast, at Orbitz Rewards VIP Hotels are accessible to all platinum and gold members. A relaxed, worry-free escape starts with a bit of research. Read on to learn exactly where Hilo is. It's situated in Hawaii, 50 miles from Kailua-Kona. 43,000 locals reside in this area of Hawaii Island. Don't vacation in Hilo without dropping by exceptional attractions like Imiloa Astronomy Center and the Pacific Tsunami Museum. Looking for a few other options? Consider the Lyman Museum and the Panaewa Rainforest Zoo. If you can spare the time, tour them all! Check out the rushing waters of Rainbow Falls. It's even more stunning after heavy rains! Want some more options? Had enough of sightseeing for one day? After somewhere quiet to relax with your travel mates? Head over to Liliuokalani Park and Gardens. But wait, that's not all! You'll be sure to have a pleasant time at Naniloa Country Club. Here, club members can appreciate each other's company and take advantage of the property's amenities. Nothing compares to exploring somewhere new with your own wheels. If you're after car rentals in Hilo, Orbitz is here to help. Picking up a car right at Hilo International Airport will ensure that you don't have to bother with transfers and cabs. A couple of the most reliable outlets include Dollar Rent A Car and Avis. They're situated close to the terminal, so they're easy to find. Make your way over to Enterprise and you'll be navigating the busy streets in no time. They are located at 875 Kanoelehua Ave, 2 miles from the town center. 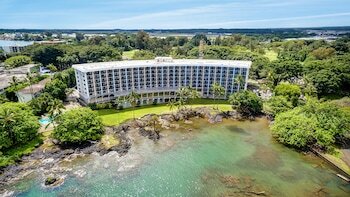 If you're planning to stop overnight, you ought to know there are only 13 hotels in Hilo. We can help you find a suitable room, but you'll have to move fast! 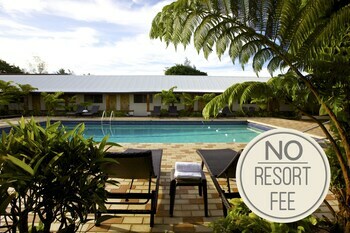 When you're planning your island getaway, look into the deals and amenities at The Inn at Kulaniapia Falls and Island Goode's - Luxury Adults Only Accommodation. Then you just need to pick the best one for you! Escaping to Hilo? Lift your tray table, put your seat upright and prepare to land at Hilo International Airport (ITO), the nearest airport. The jumping-off point to your trip, the terminal is 3 miles east of the downtown area. If you've discovered the very best of Hilo already, don't go home just yet. In fact, you've got iconic attractions close at hand! Just 25 miles away is Volcano. Many people use this locality as a base to experience the famous attraction, Hawaii Volcanoes National Park. Feeling disappointed because you have to cancel your vacation? Don't sweat it — we're definitely not going to make it worse by making you pay a fee.^ If you act quickly, your chosen hotel and airline might not either.